​Hurricane Spin Broom has a no touch large capacity bin that is built in and empties easily in seconds! 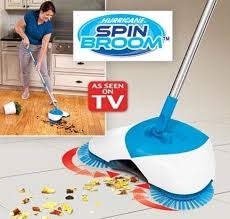 With the Hurricane Spin Broom there is No more using a broom and dustpan! 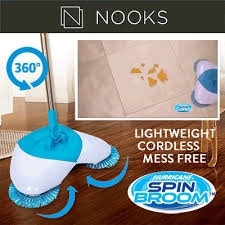 This lightweight spinning broom uses triple brush technology that rotates in cyclonic motion! Hurricane Spin Broom is a cordless, lightweight, handheld spinning broom that works on all types of hard flooring including wood, laminate, or tile! Hurricane Spin Broom has a no touch large capacity bin that is built in and empties easily in seconds! It has swivel steering for easy maneuvering for those hard to reach spots!